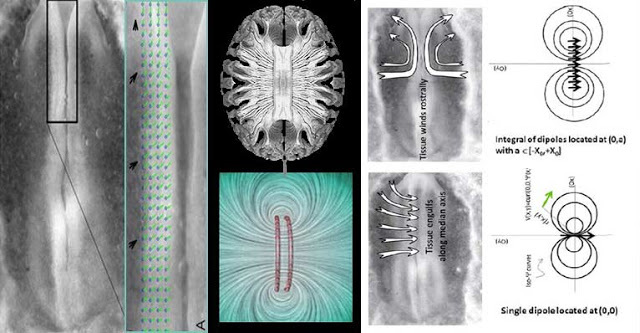 Dipole Neurology: EM solitons proven in the brains axons. One of the primary tenets predicted by Dipole neurology framework. EM solitons proven in the brains axons. One of the primary tenets predicted by Dipole neurology framework. Does MHD behaviour play a role in the morphological form and function of axon bundling right across the large scale symmetry of the brains white matter ? Particularly if in the developed brain some complex context that can be understood in terms of these four complex levels most neuroscience theories will have to be explained in. The big problem is biophysics has always been found to be deeply intertwined and controlled in these contexts of increasing priority (1-4). 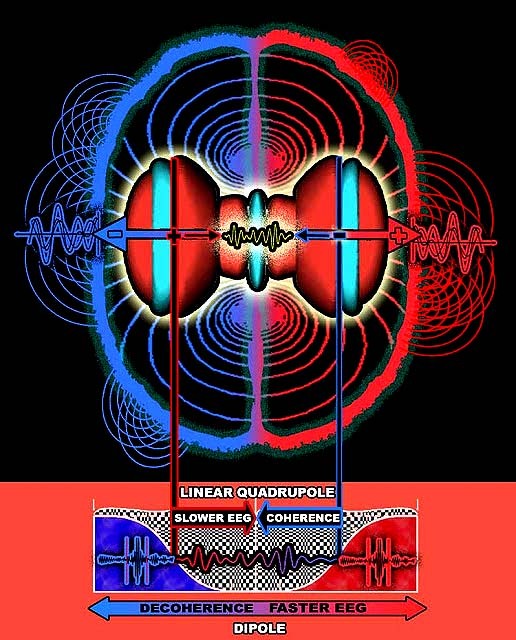 And also facets of complex system theory and computational theory are involved here, which are also different in form from morphologies we derive from simple physics. For example if proposing magnetic mechanisms for an entire brain, then the big question is, are axons a direct morphology from function in the sense of representing magnetic field lines in some way ? If they are then there are simply no primary structural morphological features left in the corticolimbic system that are now not well explained in terms of magnetic fields playing an increasingly major role in neurodevelopment. e.g. See this poster. Of course we are still left with so many outstanding theoretical holes, but some new evidence also which will be summarized here. What I did find evidence for in terms of long range biophysics to explain white matters magnetic structure appearance was entire hemisphere Ca2+ pulsing through the radial glial scaffold. (see in references Weissman, TA et al; 2004) .So the dipole neurology theory since that time has been driven by study of glial biophysics, rather than the neuron/axon. The big news here is that axons have recently been proven to be MHD in form and function. Due to the development of an extension to the Hodgkin Huxley model for nerve transmission called the soliton model . This resolves some long standing problems over axon thermodynamics. There has been some controversy over the Axon soliton model since proposed by Thomas Heimburg and Andrew D. Jackson in 2005, but last year the Membrane Biophysics Group at neils bohr institute confirmed that solitons do pass through each other as predicted by the theory. Here we should emphasize that the axon soliton is equivalent to an MHD flux tube soliton. Primarily because by their very nature EM fluids that are symmetrically confined are plasma MHD solitons due to the perpendicular magnetic field. The MHD soliton can be an adiabatic sound wave (see table 1 here) just like the axon soliton and so the axon is now consistent with every other observable morphological neural aspect being magnetic (except for neurons themselves). How does this scale up to magnetic properties across the entire brain structure ? The MHD tubes are the field lines.The first question is to what degree is there, if any coherent magnetic fields across MHD solitons ? Because bundles of tubes wit a single MHD soliton (with some dipole moment) does not always translate to that field strength facilitating an entire magnetic field coming from a white matter structure. Can there be magnetic fields across white matter bundles or the entire brain ? We do get MEG readings for such wide areas and they can be synchronized oscillations, (see “Magnetic fields at population level” in References) but our evidence so far is that each neuronal component contributes isolated activity. The framework for oscillations to occur across the brain is laid down in neurodevelopment and its this framework that is triggered by neuronal ensembles. The mechanism for Dipole neurology theory providing a magnetic field to create entire field structure is in the Ca2+ waves of the radial glia scaffold in development, there is no myelin when the brain is developing, so fields provided by the Radial Glia would be less restricted. The axons are made primarily of Ferroelectric microtubules and ion channels so would conform easily to any complex MHD field. After the pathfinding has taken place the Oligodendrocytes (white matter glial cells) start to coat the cortico-limbic nerves up to 20 at a time. So in these circumstances there should be a reduced magnetic field. In the developed brain radial glial scaffold fades to the existing astrocytes and oligliodendrocytes, and we are left speculating over whether there is any magnetic field in developed brains, primarily because neurons, axons themselves don’t provide such long range fields. Much of this speculation and various models are documented on this site and the 2009 paper. Most of the recent developments on ephatic fields etc again appear to rely on the glial mechanisms, but without more work we cannot be sure. As axonal ephatic models show (see “axon ephatics” and “axon solitons” in References) the more synchronized axons are added in a coupled state the greater the decrease in conduction speed, and this may be a principle of mutual information in physics. Because relatively speaking within the entire brain system itself lower speed = greater entropy due to the competitive dynamics increasing speeds locally. This may be the reason that the brain wide oscillations tend to be slower, and the local fast oscillation tend to decoherence. This is most notable at the brains primary poles where the fast ripples are the sharpest waves. This is one reason I define oscillations in terms of entropy (see JAGI article 2013). We know a lot about the brains neural oscillations and the major role they play in integrating information. There is still a lot that is not known about how they arise, and why there are more of them where there is more white than grey matter. See my table of oscillations located to matter types here in this blog article. First there was dendritic computation, then synaptic, now axonal.. what next glial ? It appears so. Now is a good time to summarize the fact that white matter in particular its glial cells is a current frontier field of neuroscience. Led Primarily by Douglas Fields, author of The other brain (see “douglas fields” in References). Douglas titles one of his papers “white matter, matters” ! He summarizes how it possible to modulate impulse speed and so in theory effect neural synchronization in white matter, by injecting current into oligodendrocytes. This is called the axon myelinic synapse (see “axon computation” in References). Left: Diagram from Douglas fields showing how action potentials can be inititated across the glial cells. 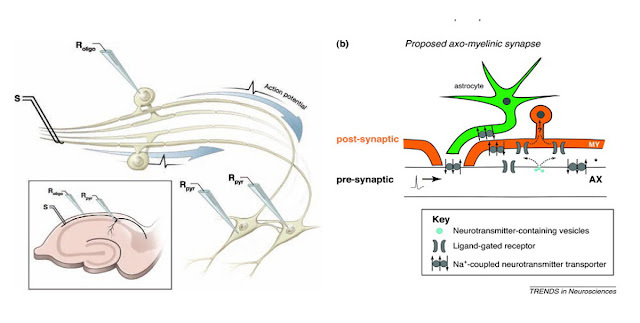 Right: This has been named the "axo-myelinic synapse", (see “axon computation” in References). The outstanding question is still what are the biophysics here ? We know that we can cut of the neurons and the oscillations still persist (see “axon computation” in References). We have touched on ephatic coupling in the myelin being MHD solitons, but what would amplify the magnetic field fall off or enable resonance across axons ? There is clearly still complexity controlled by proteins with a finesse that appears to rule out a typically crude generic magnetic field across white matter, or even fine grained quantum field containing information (in a generic linear sense) because the axons etc are not organized at that level of precision. The complexity of ion channels and mechanisms in the axon myelinic synapse suggests this is still regular neuroscience complexity and the magnetic field which assists magnetic structure formations are developmental. Remember development does not finish until reach age 25. Even for neurodevelopment alone why would this field be present at all ? It is because there are so many desirable properties of MHD solitons to be recruited in the complexities of brain development and computation. Note these MHD properties are also properties present in the white matter. What computing functions do all this give rise to ? Hyper-parallelism with deep information convolution across layered structures is my primary idea. The hyperconnected graphs that are good for solving generalized problems in approximate ways such as discrete optimization problems appears to be the reason. But that is another subject, and more of that in the next post. Modulatory effects of oligodendrocytes on the conduction velocity of action potentials along axons in the alveus of the rat hippocampal CA1 region. MEG correlates of bimodal encoding of faces and persons' names.